So I bought everything in Lush. Aside from these, I also bought the Melting Marshmallow Moment (already used) and three Pumkin bath bombs for Bloggers' Halloween, but they're still all safely wrapped up. The smell of The Comforter might be one of my favourites ever! It smells so sweet, sugary and almost nostalgic. There's also a fruity hint to it that turns out to be Blackcurrant. Now, I wasn't sure how to use this, so I snapped the bar in half and crumbled the whole half into the bath under hot running water. Oops! Turns out you don't need that much at all and the bubbles nearly took over my bathroom! However, it did smell incredible. The bubbles were really fragrant and I loved how pink it made my bath! When I got in, it made my skin feel so soft and smooth. It was lovely! I thoroughly recommend it, but remember that you can get about 4 baths out of it! Don't make the mistake I did! Mmm... Snow Fairy! Everyone loves Snow Fairy, right? The scent is incredible- Candyfloss and pear drops. So sweet and delicious. It makes me want to lick my skin, but I wouldn't actually recommend that! In the light, there's a teeny hint of shimmer, but it doesn't show up on the skin. This shower gel lathers so well. You only need a little bit to create a really creamy lather. It also makes my skin smell amazing, feel really soft and, of course, keeps it squeaky clean! I have a dry patch of skin on my arm and I did find that this made it a little irritated, so perhaps not one for sensitive skin. 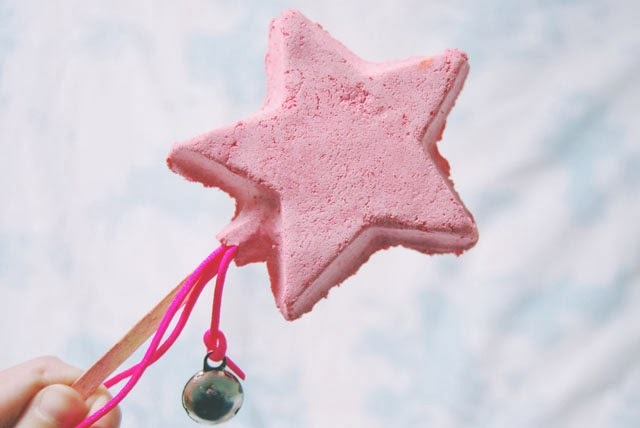 I almost bought the Magic Wand Bubble Bar last year but decided against it and regretted it all year. I just had to get it at the first chance I got! I'm not going to lie- I pretty much only bought it because it's pink, star-shaped, on a stick, with cord and a jingle bell. 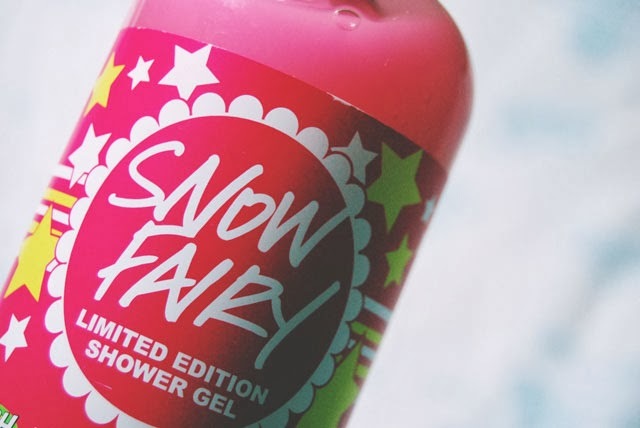 However, it does smell really good too- A bubble bath version of Snow Fairy! To use it, I swished the wand into the bath (and pretended I was a witch making a potion!) until I had a decent amount of bubbles. The stick is a little feeble and I do worry that the whole thing will fall into the bath. I think the bubbles would suffocate me if that happened! Still, I only need to use a tiny bit to create enough bubbles to satisfy me, so it will last forever! I love the Bubblegum Lip Scrub, I love Christmas and I love anything cola-flavoured. So Santa's lip scrub seemed perfect for me! Wrong. It tastes acrid. As the bubblegum variety is edible- and delicious- I figured this one would be too. It has these cute little hearts in the scrub which seemed to be made of sugar so I licked them off. Don't do that. They got stuck in my throat and tasted disgusting. Yuk! However, when I realised that I should avoid the hearts, it wasn't so bad. It certainly left my lips feeling soft and smooth, although I still think I'll be sticking with the bubblegum flavour! It smells like sherbert lemons! That's really all you need to know. It's divine. I popped it in the bath and it started foaming immediately. A couple of minutes later, the orange centre started bubbling out. The confetti inside disintegrates into a gooey substance. I'm not going to pretend that I didn't squish every last one of them! I just can't get over the smell of it. It fills the whole bathroom with an amazing, refreshing, fruity scent and it turns the bath water bright orange. 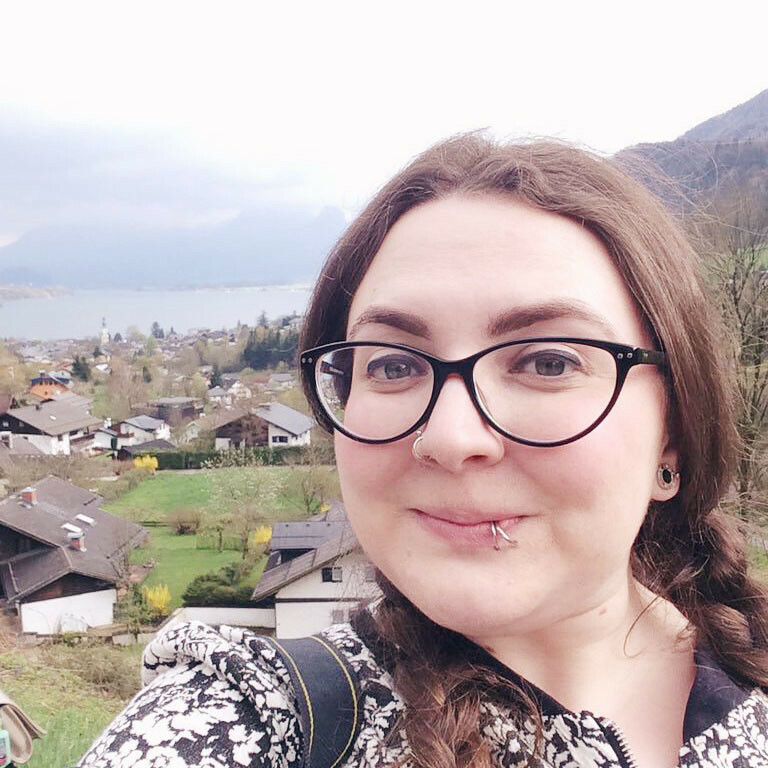 When I got out of the bath, I noticed that it had a small amount of glitter hidden inside it, so I was slightly sparkly. I love it! 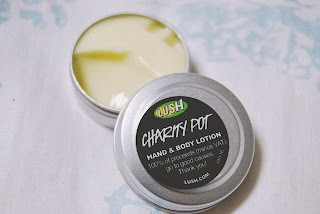 This mini pot of Charity Pot was only 50p but 100% of proceeds go to good causes. Every little helps! Unfortunately, I don't like the smell at all. It's a very earthy floral smell- I think it's the geranium. The smell does fade quickly though, so maybe I can get used to it. It does make my skin feel smooth and it's very quickly absorbed. The consistency is very light, almost a gel and a little goes a long way. Alright, Can i just say i am super excited you reviewed these things?! I have wanted to order some things from the LUSH site for about a year but i am so afraid they will be yucky. But you are so honest in all of your posts, and i trust your judgement :-) Scary Huh? Do you know if they are harsh for sensitive skin? 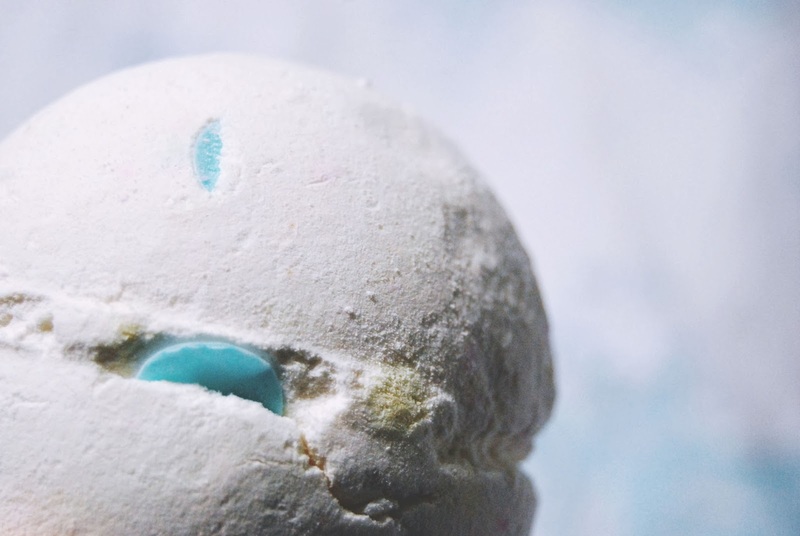 The bath bombs and bubble bars are fine for sensitive skin- I think I read that they were actually developed for baby skin originally. I'm not so sure about Snow Fairy, as it made the rash on my arm dry and itchy. 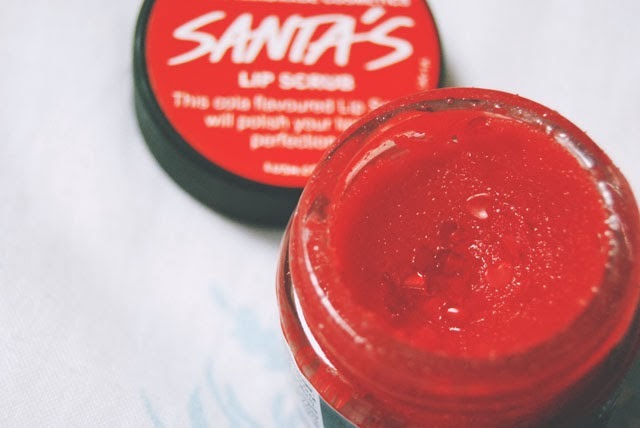 I gutted that the Santa's Lip Scrub is rubbish, was really looking forward to trying that one. Oh well, will just have to comfort myself with an next bar of The Comforter! Me too! Especially as it was supposed to be cola flavoured. It's not though- It's made from dates. Ew! Great, honest reviews. Sad about the Santa scrub though as I love my Mint Julips one! I haven't tried that one but I love mint flavours! Definitely get one! it's amazing! Aw it's a shame you don't like Charity Pot, it's one of my favourites. I think it smells like turkish delight. I think you'd like creamy candy as well! Have you smelt rose jam yet? Ah, I don't like Turkish Delight! That will explain it! I haven't smelled Rose Jam. I don't really like rose scents. I love Lush! I have a bag of the Christmas stuff here and I am slowly working my way through it all before I buy more! I'm WAITING for these to make it over to the US. Why the heck would they put inedible pieces into a lip scrub, haha? It just doesn't make sense! 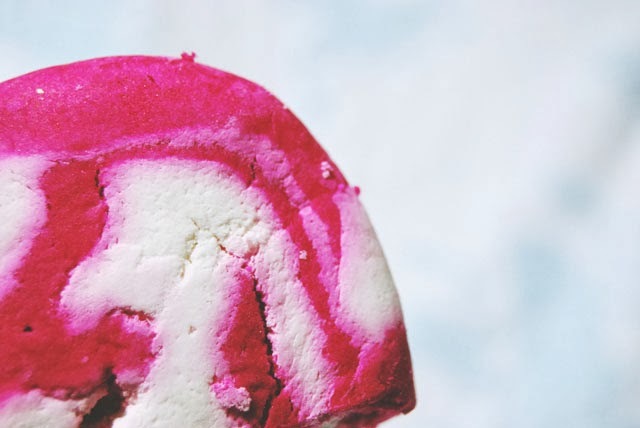 I'm always super excited for LUSH's Holiday range! They may have super expensive shower gel but the scent ALWAYS lingers on the skin and that's so worth it to me! 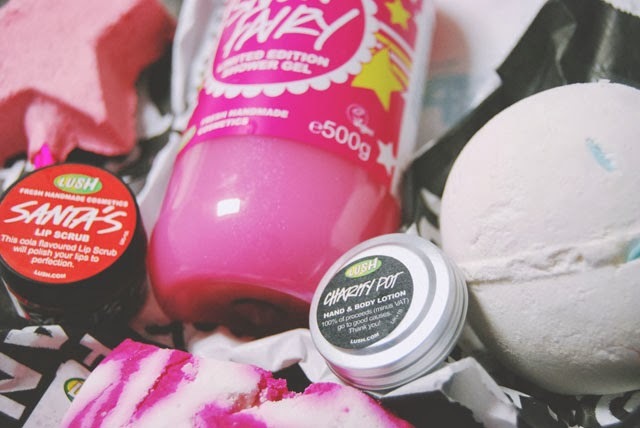 I love the Snow Fairy shower gel, I had it last year, and Dragons Egg is my all time favourite bath bomb! I love Lush so much!